"Sir, did you get a cut on my dam?" The agriculture department official told Banabai Kumre that nothing would come of her complaint of corruption, because he had already paid hush money to the district collector and the chief minister. So the septuagenarian did what she thought was best: she went to Mumbai and asked Maharashtra's chief minister if he had received a cut on the check dam on her land. Banabai hails from village Kharula in Maharashtra's Yavatmal district. The district attracted media spotlight in recent years because of a large number of farmers' suicides. Banabai's family of six barely managed to make ends meet. Though her extended family of more than 20 owned a farm as big as 10 hectares, only parts of it were cultivable where they grew jowar, pulses and paddy. But their routine was upset in early June this year when a check dam flooded after a spell of heavy rains. The rushing waters destroyed the seedlings on Banabai's land. The dam was not very old. It was constructed barely a year ago. Banabai decided to report the matter to the agriculture department's office at Yavatmal tehsil. After all Rs 3 lakh was spent under the prime minister's relief package for constructing the dam. An inspection team of the department visited the site on June 16. It confirmed Banabai's allegations that inferior quality material was used to construct the dam. Fearing consequences, V B Mitkari, a supervisor with the agriculture department, who was involved with the construction of the dam, went to Banabai's house and unleashed a volley of threats. He accused her of breaking the dam and told her that he had "fixed" all higher ups. Unfazed, Banabai filed a second complaint with the district collector, mentioning Mitkari's threats and demanded that the official be suspended. 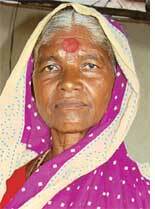 She alleged that only Rs 1 lakh had been spent on the dam, instead of the officially sanctioned Rs 3 lakh. She also alleged that instead of black soil, murum (a local variety of thick gravel) was used to construct the dam. But there was no action. So Banabai went back to the collector's office on July 1, and asked him directly, " Tumhi paise khalle ka (did you take a bribe)?" The collector, Sanjay Deshmukh, was initially speechless. But within moments his team was in a hustle. An inspection team was dispatched immediately to the check dam site. The memory of that day is precious to Banabai. "The inspection team and I had to travel by the collector's own lal divyachi gadi' (official vehicle with a red lamp), because there was no other vehicle at the collectorate at that time," she says with a smile. The team's findings confirmed Banabai's allegations. By this time, Banabai had become a bit of a star in the local media: pictures of the elderly woman walking with the help of a stick were splashed in several local dailies. On July 3, a pressured collector issued an verbal order that the dam on Banabai's land be reconstructed. On the same day, Yavatmal district's panchayat Samiti also passed a resolution supporting Banabai's demand that Mitkari be suspended. But no action was actually taken. So on July 7, Banabai went to Mumbai and sought a meeting with Maharashtra Chief Minister Vilas Rao Deshmukh. She had to wait for two days. The wait was not in vain. Describing the meeting, Banabai says, "I recounted what Mitkari had told me, and asked the chief minister if indeed any money had arrived at the mantralaya (the building that houses most departments of the Maharashtra government)." The chief minister gave her a patient hearing. Banabai says, "He told me, you have come from very far. Please sit down. He ordered someone to bring water for me. " During the 15- minute conversation that followed, Banabai gave the chief minister an account of the corruption in works performed under the farmers' package. The chief minister assured Banabai that he would take personal interest in the case. On August 17, Mitkari was suspended. Banabai's case attracted a lot of attention from the media. Her neighbours, are, however, somewhat guarded in their reaction--evidently fearing reprisal by the agriculture department. Banabai's life has returned to its daily rhythm. As this correspondent took leave, she told her, "One is lucky to land a government job. But those who get it become arrogant. These people have robbed poor farmers. They should be punished."